Being a social person isn't always a good thing. For the most part, it's a blessing. It really is. As much as I enjoy meeting new people and hearing their story, sometimes being a social butterfly can often invite questionable people into one's circle. Two weekends ago, I went to Montreal for the Food Bloggers of Canada conference (big, BIG love to my friends at World Kitchen for sponsoring me!) While there, I met some lovely bloggers for the first time and reconnected with those I haven't seen in a while. I'm so blessed to be part of such an incredible community. Unfortunately, I also encountered some random, non-foodie folks as well, which isn't at all unusual for me - of course it isn't. It's me. There are times I can just smile at someone while standing in line and they suddenly develop a raging case of verbal diarrhea. Before long, I'm in their will to inherit their blind guinea pig Stuart and water damaged Martha Stewart magazines. I wasn't in the city for more than an hour when a man cornered my friend Shannon and I in a convenient store. He proceeded to tell us about the time he was fourteen and he used to make the very maple candy the shop owners were selling near the till for an insulting twenty-five cents. Shannon managed to Houdini herself out of the conversation after three minutes, while I was left listening to a very detailed description of how the candy was made back in the day. I would have been quite fascinated if his breath didn't smell like he licked the bottom of a beer vat. Unfortunately, the more passionate he got about his story, the closer he edged to my face. I was never more grateful of a brisk, steady breeze than I was that night. Fast forward to Saturday evening. After an eventful day of speakers and sessions (and our keynote speaker Ricardo, who is incredibly funny and absolutely charming), eventide found us craving a late night jaunt to enjoy some Montreal-style bagels, despite the fact we were spoiled with an amazing Grilled Cheese and Tomato Soup lunch from Dairy Farmers of Canada, a beautiful Indian-inspired lentils dinner sponsored by the fabulous folks over at Canadian Lentils, and delicious snacks in between like fresh chocolate chip cookies from Ricardo's kitchens. Anyway, back to the bagels. Our party consisted of three food bloggers, two brand representatives, and a foodie in training that can sing Weezer songs at two o'clock in the morning better than Weezer themselves. We called in for a larger cab that would not only would accommodate all six of us comfortably, but spoke English. And they delivered. It has to be said that Montreal's taxicab system is on point and pretty efficient. As the hotel valet attendants called us over to the van, I parked myself in the front seat as there was only enough room for five in the back. I'm actually okay with riding shotgun in cabs because not only do I tend to get a bit carsick sitting in the back, I like to get myself familiarized with the people driving me around, especially when I plan on using them for more than one stop. It makes for a pleasant experience. Enter Jimmy*, our taxicab driver. *Jimmy's name has been changed not to protect the innocent, but because I couldn't remember what his actual name was for the life of me and he looked like Jimmy Fallon. As we drove through the Montreal traffic, I asked about his taxicab driving experience (17 years) and learned he has four children (Ages 5-21). He likes to listen to hip-hap (Not hip-hop, hip-hap as all of his CD collection stated) but he's a notorious song changer. I asked if he was originally from Montreal (He was born in India, but has lived in Montreal much of his life). I also told him at one point he needed to get his tire pressure checked as the warning light was glowing a bit too brightly for my liking. If he's driving customers around the city, safety first, right? Jimmy became our driver the rest of the night - until it started to rain around midnight and traffic increased. He was on another run and couldn't get to us right away, so we had to summon another driver as it was getting really late. We closed down SUITE 88 Chocolatier, but not before enjoying an incredible London Fog gelato, complimentary pieces of Belgium chocolate, and purchasing treats to take home to loved ones. The employees were so gracious to let us stay while they cleaned up and we waited for the cab. Then the weirdest thing happened. Jimmy texted me. Huh? I know I didn't give him my number. It was later explained how the Montreal taxicab system works. And this is where the efficient cab system has a downside. When one books a cab - or depending on which company is contacted, the number calling is automatically sent to the driver. 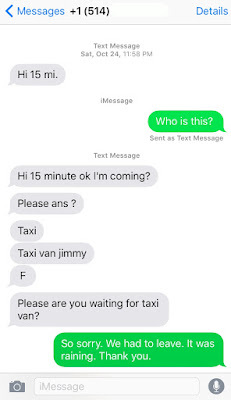 This gives the driver the opportunity to text you an estimated time arrival if they so choose to. Oddly enough, despite the fact that three of us called him throughout the evening and I called only once, I somehow became the number he contacted. As pleasant as he was....Jimmy? 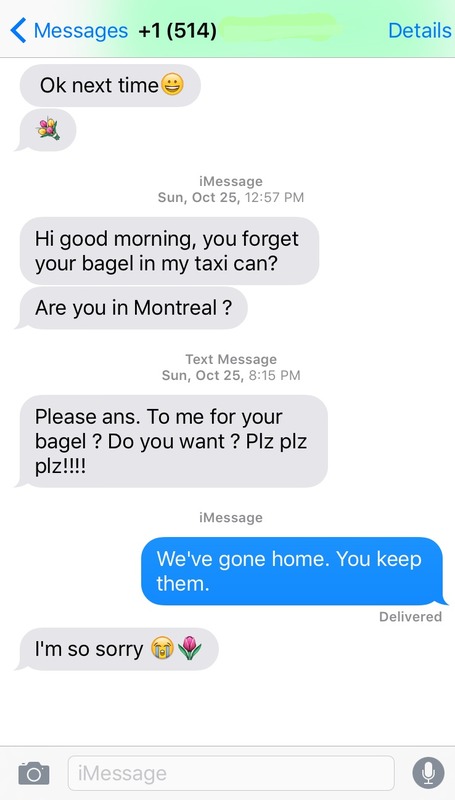 Keep the bagels. It has to be disclosed that I still prefer New York bagels. 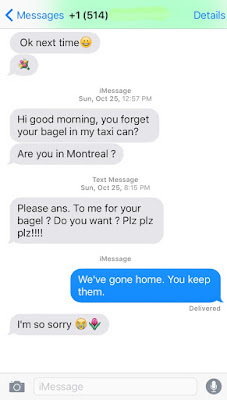 Mes excuses, Montreal. Je t'aime encore. Don't get too impressed there, friends. I used Google Translate for that one. Four years of French in high school and I can barely say Bonjour properly. Moral of the story: Try new things, but heed your Mother's advice and don't talk to strangers. A good tip? 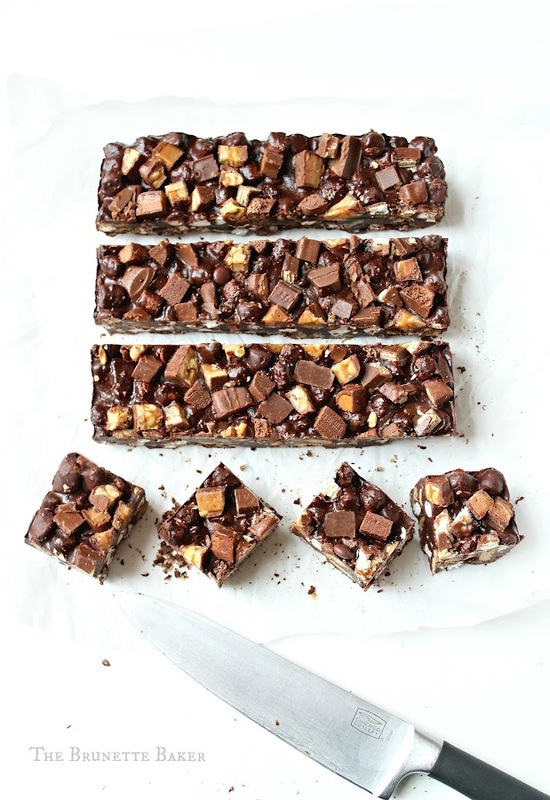 When you have a gazillion fun-sized candy bars leftover from Halloween, make these Rocky Road Bars. I've almost called my version Rocky Terrain Bars instead of Rocky Road Bars because if these were actual land masses, no one would be calling it a road. *This is a perfect opportunity to use up any plain chocolate bars left in your child's Halloween stash. Prepare a 9-inch baking dish by lining with parchment paper or aluminum foil, leaving an inch or so hanging over to ensure easy removal when ready to cut into bars. Chop chocolate, digestive biscuits, and candy bars into coarse pieces. Set aside. In a medium, heavy bottomed saucepan, melt butter and golden syrup together over medium-low heat. Once both have come together, remove saucepan from heat and immediately add in chocolate and peanut butter. Stir frequently until mixture is smooth, creamy, and lump-free. Add in digestive biscuits and mini marshmallows and mix together until both are nicely coated and completely covered with melted chocolate. Pour chocolate cookie mixture into prepared baking dish. Quickly smooth over surface with an offset spatula and immediately place chopped candy bars over top mixture, pressing down gently to ensure candy bars stick to cookie mixture. Refrigerate for 4 hours or until completely solidified. Remove from baking dish and cut using a sharp knife. These are pretty rich, so I recommend cutting into two-bite bars. LOLOLOLOLOLOL!!!! This post was so so funny but especially those texts! I wish we were friends. 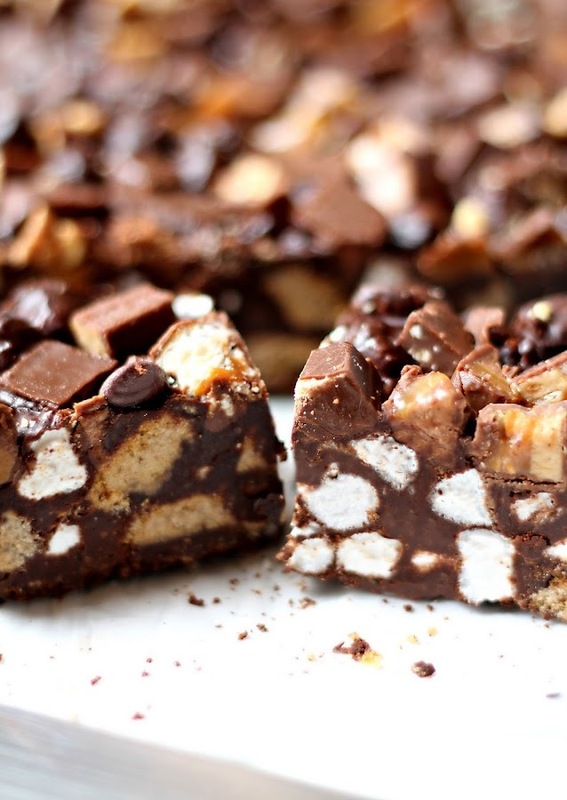 Your Rocky Road's make mine look boring!! Pinning these! I found these on Facebook and I am so happy I did! I don't have kids, but now have a perfectly justifiable reason to buy an entire box of discounted Halloween chocolate. My Mom used to make Mallomars years ago and did the same thing with leftover candy. I can't wait to try them. omigosh both of those experiences sound so par for the course for a variety of my NYC experiences. Apparently all big cities are the same. I would totally devour every last bite of these. They look wonderful!!! Thanks for sharing. I made these last night and they're all gone today!! My co-workers loved them!! Thank you for such an awesome recipe!!! I made these for my Christmas Cookie Exchange Party. I can't believe how easy and delicious they are!. Everyone raved about them!!! I'll be making these for every event I have for this poin on! Thanks for a wonderful recipe!! !